Bombing Iran could be the final nail in the coffin of America—a decaying and morally bankrupt superpower where torture has been normalized and where the President is now free to kill anyone he chooses, anywhere in the world, who he happens to suspect is a terrorist. Right now, Iran appears to be the object of universal detestation, at least among those who control the mainstream media and who are anxious to persuade the easily duped masses that Iran is a major threat to civilization. 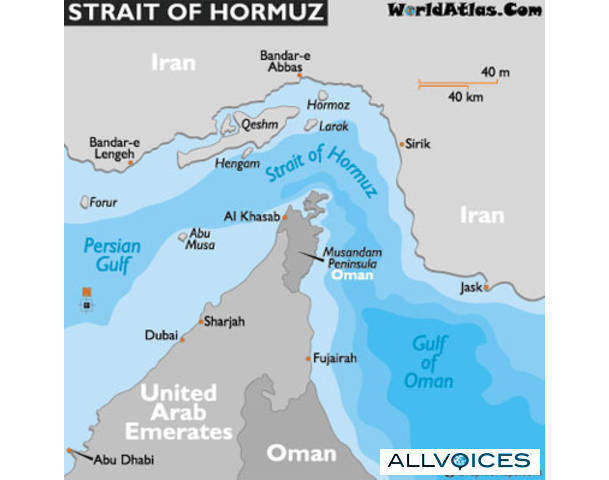 Iran is perfectly capable of shutting down the Strait of Hormuz if it wishes, doing immense damage to the US navy in the process. It possesses a vast array of anti-ship weapons called Sunburn missiles, which it has procured from Russia and China over the last decade. These are state-of-the-art weapons developed by the Russians as a low-cost challenge to the expensive, tech-heavy weaponry of the US. Specifically, they are designed to sink ships, including America’s titanic aircraft carriers. The imminent conflict, which now belongs in the high probability spectrum, is a conflict into which Russia and China cannot fail to be drawn. Their interests are inextricably linked with those of Iran. You could say that Iran is their semi-independent protectorate and ally. If Iran were attacked and if Russia and China stood by and did nothing, they would lose face forever. They would be signaling to the world that they are weaklings, only too ready to cower at the feet of the American superbully. Indeed, they would then be next on America’s hit list. Russia has a new 100-ton monster of a ballistic missile in the pipeline. It is aptly named Satan. And it will be used to devastating effect against America if America gets too big for its boots and gets overly aggressive. The US Navy is an efficient and professional organization, at the cutting edge of modern warfare, but the Strait of Hormuz is not the kind of environment in which the American navy would be invulnerable. The Iranians can be expected to have a field day in the narrow confines of the Persian Gulf, virtually drawing American ships into a series of ambushes. If one samples the technical literature on various military websites, one finds there is a lively debate going on about American ship defense systems. Nobody claims that any such system offers full protection against ship missile strikes. Right now, most ships remain vulnerable to such strikes, including America’s leviathan aircraft carriers. As for oil tankers, these are even more vulnerable than aircraft carriers. If attacked, these will sink easily, clogging up vital sea lanes and doing immense environmental damage to the entire Persian Gulf region. It is of interest to note that the US is busy working on a new generation of laser defense to counter the sophisticated anti-ship missiles possessed by Iran. However, these are still in process of development. This gives Iran a relative advantage if it is attacked now rather than later. Ironically, the longer America and Israel delay in attacking Iran, the better their chances of successfully countering the retaliatory measures they can expect from Iran. Both America and Israel are unfortunately just not ready to wage the type of warfare they prefer to wage and at which they so excel: shooting fish in a barrel. Unlike Iraq, which the warmonger neoconservatives told us would be a “cakewalk”—easily conquered in six weeks—Iran is unlikely to offer its American and Israeli antagonists easy opportunities to indulge in their fish-in-a-barrel fantasies. Our courageous remote control warriors, hunched over their keyboards far from the din of battle, may be able to rain down death and destruction on innocent civilians in Iraq, Afghanistan, Pakistan, Yemen and Somalia, meanwhile salving their consciences by calling their victims “terrorists”, but there is nothing they can do with their drones to stop Iran’s deadly missiles from blowing up American aircraft carriers or sinking oil tankers in the Persian Gulf. The Sunburn is perhaps the most lethal anti-ship missile in the world (see also here), designed to fly as low as nine feet above groundwater level and at more than 1,500 miles per hour. The missile uses a jerky pop-up maneuver for its terminal approach. This enables it in effect to dodge, or jump out of the way, of the Phalanx and other anti-missile defense systems: in short, to hit its target bang-on without being intercepted en route. Given their low cost, these ship missiles are perfectly suited for close quarter naval conflict in the pond like environment of the Persian Gulf. The Sunburn is versatile and easy to use. It can be fired from practically any platform, including the back of a flatbed truck. It has a 100-mile range, which is all that is necessary in the narrow Persian Gulf, with its 40-mile width round the Strait of Hormuz. Fired from shore, the Sunburn will punch a room-sized hole through any ship in the Strait of Hormuz in a fraction of a second. These missiles therefore present a serious threat to the US Navy. Their power to inflict horrendous damage on hostile intruders simply cannot be exaggerated. Compared to the Exocet, the Sunburn is a much larger and faster missile. It possesses a far greater range. Its guidance system is spot-on. The Sunburn can deliver a 200-kiloton nuclear payload (a 750-pound conventional warhead) within a range of 100 miles, more than twice the range of the Exocet. It seems the missile was specifically designed to defeat the US Aegis radar defense system. The Sunburn’s astonishing accuracy was demonstrated recently in a live test staged at sea by the Chinese and observed by US spy planes. Not only did the Sunburn missile destroy the dummy target ship, it scored a perfect bull’s eye. It succeeded in hitting the crosshairs of a large “X” mounted on the ship’s bridge. Unlike America’s drones, the Sunburn is not in the business of creating “collateral damage.” It does not kill innocent civilians by the score. It kills only the enemy. US ships in the Gulf will already have come within range of the Sunburn missiles and the even more advanced SS-NX-26 Yakhont missiles, also Russian-made (speed: Mach 2.9; range: 180 miles) deployed by the Iranians along the Gulf’s northern shore. Every US ship will be exposed and vulnerable. When the Iranians spring the trap, the entire lake will become a killing field. The Sunburn’s payload hit, with its 750-pound conventional warhead, is apparently insufficient to sink an aircraft carrier, but it is enough to sink most other ships and their crews. So it is generally opined in the technical literature. No conclusive studies, however, have been carried out to determine the effect of a swarm of missiles attacking an aircraft carrier simultaneously. Perhaps there is no need for such a study. Common sense will tell you that a swarm of killer bees is much more dangerous than a single bee. One bee you can easily swat; a swarm of bees you cannot. Aegis and RAM systems do not stop Sunburn missiles. Those systems were designed to stop subsonic not supersonic anti-ship cruise missiles. Even then they were unsuccessful in stopping an Iraqi (subsonic) Exocet when it struck the American warship Stark during the Iran-Iraq war. Supersonic anti-ship cruise missiles travel faster than a rifle bullet and it would take no more than three of them to sink an aircraft carrier. In fact, any surface ship is a floating coffin. If anyone out there knows of a technology that can stop a rifle bullet in full flight, please let me know what it is. “You don’t have to be Hannibal preparing for the Battle of Cannae,” military observer Russ Winter writes, “to see that the Strait is a potential “shooting gallery”. The Strait of Hormuz is in fact an ideal ambush location for large and cumbersome ships that offer such easy targets you would have to be blind to miss them. Without a doubt, the Iranians have marked out every firing spot along the Persian Gulf coast. Locating these hiding holes with low-flying attack helicopters will not be easy. Helicopters can be shot down. Equally impressive is Iran’s missile range: 1500 miles and growing. Hostile Bahrain and Qatar can easily be hit by the longer-range versions of the Sunburn or Onyx. So can the Saudi oilfields. Indeed Israel itself, though further away, could suddenly find itself under a shower of deadly missiles, not only from distant Iran, but from Hezbollah just across the Lebanese border. It is commonly acknowledged that Israel cannot go it alone in fighting Iran. To wage a successful war against Iran, Israel needs American help. Israel would naturally prefer America to do its dirty work for it. Should Israel act alone, it would face the extraordinary problem of needing to refuel its bombers en route to targets about 1,000 miles away and refueling them again on the way back. Israel has of course achieved a modest success in destroying the nuclear facilities of two other relatively primitive countries in the region: Iraq and Syria. These two past Israeli successes are not overly impressive. As achievements, they are small beer. That is, compared to the massive challenges Israel would have to face in Iran. When Israel destroyed Iraq’s Osirak nuclear reactor in June 1981, it was one ground-level building it destroyed. That simple operation required 14 Israeli aircraft. Israel’s other success, demolishing a partially constructed Syrian facility in September 2007, involved targeting a rudimentary warehouse-like structure built on a single floor—an exceptionally easy ground-level target. The potential targets in Iran are not only far more numerous: they are widely dispersed and buried deep underground. Many of them are probably secret facilities whose very existence is unknown. There is the fuel-enrichment plant at Natanz, a collection of below-ground facilities used to produce enriched uranium. Then there is the newer Fordow fuel-enrichment plant near Qom, built into the side of a mountain and buried deep underground under several layers of reinforced concrete. It is generally acknowledged that to crack open Fordow, and destroy its alleged nuclear weaponry, would be a task beyond Israel’s modest capacity. At a pinch, America could do it, maybe; but certainly not Israel acting on its own. There are two other Iranian nuclear sites Israel would need to attack: the heavy-water reactor at Arak and the yellowcake-conversion plant at Isfahan. Perhaps even this is no more than wishful thinking. Note the loaded phrase: “known underground nuclear sites.” Best not to mention the unknown ones. To achieve victory in Iran, Israel would be stretched to the limit. It would have to deploy several B-2 stealth and B-52 bombers, fighter-bombers and helicopters, along with ship-launched cruise missiles. It would not only need to take out Iran’s underground nuclear facilities—an impossible task—but it would have to destroy Iran’s communications systems, air defense and missile sites, Revolutionary Guard Corps living quarters, munitions storage depots, airfields, and ship and port facilities—not to mention missile boats, minelayers and midget submarines. Given that Israel, for all its vaunted might, was unable to defeat valiant little Hezbollah in 20o6, the chances of it stealing an easy victory from Iran would seem to belong in the realms of fantasy. Not all Americans are in favor of aiding and abetting Israel in yet another rampage of wanton destruction—not after the crimes of Gaza which have left an indelible stain on Israel’s already dubious reputation. Destroying Iran’s infrastructure may make sense to some callous Americans, but to many others it would seem a cruel and vicious enterprise. To poison a population of 74 million people, most of them women and children, with tons of depleted uranium, while putting thousands of other innocents into wheelchairs, is not an achievement likely to bring honor or prestige to Israel. Not all of us have forgotten the lessons of history. We are cognizant of the fact that Iran has not started a war for 30o years. That it simply wishes to be left alone. And that it is Israel, rather than Iran, that seems to suffer from a serious pathological problem—a “collective madness”—with more than enough blood on its hands. The US cannot eradicate the Iran regime. It cannot bring Iran under its control, that is, not without creating a disaster for itself and the entire world….Doing that entails huge costs and risks to the US, all the countries in that region, and the many other countries that would be affected by it, including Russia, China, India, Pakistan and Afghanistan….Right now, Obama must stop Israel from attacking Iran. (Emphasis in original). He must do so in the strongest ways available to him, like denying airspace to Israel for refueling its bombers. … The US [should] prevent Israel…from flying over Iraq and refueling. Sound advice, it seems to me. Why support Israel? Cui bono? Iran has much more to offer America than Israel does. Iran has oil in abundance, Israel has none. Iran does not hold America’s political class to ransom. Iran does not try to browbeat successive American administrations into putting Iranian interests before American ones. Iran’s dual citizens do not spy on America or sell American military secrets to Russia and China—there are no Iranian Rosenbergs or Jonathan Pollards. Iran does not coerce Americans into fighting and dying for it in foreign wars. Iran does not expect $3 billion a year in handouts, and even more in loan guarantees that never get repaid. Iran would be a far greater asset to America than Israel could ever be. Israel is a liability and a burden. More fool America for cuddling up to a “friend” who has stabbed it in the back in the past—the Lavon affair, the USS Liberty incident, the Jonathan Pollard betrayal—and is more than likely to stab it in the back again at some time in the foreseeable future. Dump Israel. That’s my advice. Before Israel sets the world on fire, taking America with it. Obama has in recent months begun to make it clear to Israel that the United States would not get involved in a war started by Benjamin Netanyahu without preliminary US approval. Indeed, on January 20, the Chairman of the Joint Chiefs of Staff, Gen. Martin Dempsey, informed Netanyahu that the US would not defend Israel if it launched an attack on Iran that had not been coordinated in advance with the US. In May 2008, Netanyahu’s predecessor, Ehud Olmert, had requested the approval of George W Bush for an air attack on Iran. To his credit, Bush had refused to countenance any such move. Netanyahu has since defied the US administration by refusing to assure Washington that he would consult them before making a decision to attack Iran. Other US officials have apparently made it clear to Netanyahu that the US, unless fully consulted, would refuse to come to Israel’s aid in the event of Israel declaring war on Iran unilaterally. If Israel did that, it would be on its own. The capital of America needs to be moved back to Washington. Tel Aviv is too far away. When Zbigniew Brzezinski says, “An Israeli attack on Iran would create a disaster”, he must be taken seriously. Russia does not want any military operations to be waged against Iran or Syria. These two countries are allies, and both are considered guaranteed partners of Russia. A strike against Syria or Iran is an indirect strike against Russia and its interests. Everybody should acknowledge that Fascism is making great strides on our planet. What they did in Libya is nearly identical to what Hitler and his armies did against Poland and then Russia. Today, therefore, Russia is defending the entire world from Fascism. No need to ask who the New Fascists are. Just turn on your television sets and you will see their smiling faces, telling you how much they love and cherish you—as long as you vote for them—and as long as you die for them in foreign wars for the aggrandizement of Israel. It certainly needs to be asked: How much longer will America continue to fight Israel’s wars? What hold does Israel have over America? Is America prepared to sustain immense damage to its vital interests on behalf of an unstable and insolent ally that remains, if numerous polls are to be believed, the world’s most hated nation? There are some indications that not all American operatives, especially in the armed forces and the CIA, are overly impressed with Israel’s increasingly irresponsible behavior. A significant rift in the friendship appears to be developing, a rift that will hopefully grow in time as America finally comes to its senses. The tension between longsuffering Iran and an insufferable Israel, goading it to frenzy, is now at fever pitch. ELEANOR HALL: Iran’s leadership says it’s sheer lies that it’s behind the [recent] attacks [on Iranian embassies in India and elsewhere] and that the Israelis have planted the bombs themselves to discredit Iran? ELEANOR HALL: How incendiary is the relationship between Iran and Israel right now? Are we looking at an Israeli strike on Iranian nuclear facilities…? GENEIVE ABDO: I think it’s certainly a decision Israel is taking very seriously. ELEANOR HALL: So how dangerous do you think the situation is right now? GENEIVE ABDO: I think it’s very dangerous. Far more dangerous than any escalation tension we’ve seen in 30 years. ELEANOR HALL: So, how dangerous could it become if the Israelis do strike? If Israel decides to launch an all-out attack on Iran, we can be sure of one thing: the towers of Tel Aviv will come toppling down. Not necessarily now, but one day in the distant future, when it is decided that vengeance is a dish best served cold. The nuclear complex at Dimona could well be destroyed—if not now, later on, in the fullness of time—making Israel an uninhabitable wasteland. Given its miniscule size, Israel could be destroyed in a single day, if not by Iran, then almost certainly by Russia or China. No one seriously expects to see the annihilation of Israel right now, but Israel will have to take the consequences of its actions one day. Israel will reap what it sows as Armageddon approaches.